The red, white and black colours of Andy Stewart have been a familiar sight at the Cheltenham Festival for the past eight years, since Cenkos finished second to Tiutchev in the 2000 Irish Independent Arkle Trophy. In those eight years, Stewart has had any number of placed horses (including Gwanako, second, and Turko, third, already this week) but it took yet another Paul Nicholls trained improver, Celestial Halo, to break the duck in the JCB Triumph Hurdle. “We had a tipping competition earlier this week and I tipped Franchoek to win,” said Stewart, who was almost, but not quite, lost for words. It was Alan King, the trainer of the hot favourite and runner-up Franchoek who was among the first to congratulate Stewart. “I’m delighted you have had a Festival winner, but why did you have to pick this one?” he said. Celestial Halo will not be put away for the season yet and Stewart is keen to take the horse to Liverpool next month. “Today was only his third race since he was gelded and he is a two and a half miler in the making,” the owner said. Nicholls was confident before the race that with the adjustments they had made and with the ground in his favour, the horse course make a big impact. The trainer added added: ““I knew we had it right and I knew we could ride him positively. He jumps, he gallops and that’s the way to do it today. Trainer Alan King offered no excuses after even-money favourite Franchoek went down by two and a quarter lengths to Celestial Halo in the Grade One JCB Triumph Hurdle. The Barbury Castle handler said: “Franchoek has run a smashing race and there are no excuses. “I thought he might win turning for home and he has given his all. “I don’t know if he will run again this season. “We just need to re-group and see where we go from here. Sabrina Harty’s cousin Eddie won the Anglo Irish Bank Supreme Novices’ Hurdle with Captain Cee Bee. 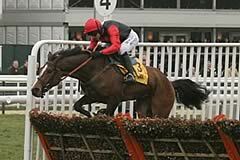 The gelding’s owner Gerry Crehan commented: “It was a very good run and we’re very pleased with him. We took on Franchoek before and we’ll beat him on better ground. He was staying on well and ,for a small horse, he’ll probably like a bit of a trip. Second-season trainer Charlie Longsdon was thrilled to be in the winner’s enclosure with fourth-placed Songe, who was only his second Festival runner. He said: “He travelled and really battled. The first two are really serious horses. I’m really happy, this is a really good start and he’s been so consistent. He’s the fourth best juvenile of the season so I can’t complain. 2. JCB, which supports the contest for the seventh time this year, is only the race’s third sponsor. The Elite Racing Club was due to back the race for a fifth time in 2001 when The Festival was cancelled, while the Daily Express sponsored from 1965 to 1996. The race was originally run at the April Meeting but was transferred to The Festival in 1968. 3. The JCB Triumph Hurdle has been one of the most competitive races of The Festival. 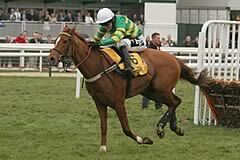 The 2006 field of 17 was by far the smallest since Connaught Ranger beat 13 rivals in 1978 - the recent introduction of the Fred Winter Juvenile Handicap Hurdle has meant that the JCB Triumph Hurdle now attracts the very best four-year-olds. The race regularly reached the safety factor, reduced from 28 to 24 in 2004. In fact, the 14 runners in Connaught Ranger's year probably had more to do with the transfer of the race to April following the abandonment of racing on Gold Cup day than any loss of its competitive nature. The smallest field was for its first running at Cheltenham in 1965, when seven runners took part. The largest field was 31 in 1970. 5. Two horses have gone on from winning the JCB Triumph Hurdle to victory in the Smurfit Kappa Champion Hurdle. Persian War won the Triumph in 1967, and reeled off three Champion Hurdles from 1968-70, while Kribensis won the Triumph in 1988 and the Champion Hurdle in 1990. 10. It was in the 1981 JCB Triumph Hurdle that Martin Pipe, the 15-time champion jump trainer who retired at the end of the 2005/06 season, enjoyed his first Festival success with the 66/1 shot Baron Blakeney.